Today, Green Builder Media, announced the winners of its 7th Annual Green Builder Home of the Year Awards, and the Grand Overall Winner, is Desert Rain! We could not be more thrilled. Located in the existing, old Bend, neighborhood, this home strives to become the first residential project in the U.S. to meet the rigorous requirements of the Living Building Challenge (LBC). This award is an acknowledgement not only of the hard work involved in building a green home, but also to the dedication homeowners Barbara Scott and Tom Elliot have had throughout the process. Read more about these award-winning homes in the December 2014 issue of Green Builder magazine. Les Wold, managing partner of Effect Home Builders in Edmonton, Canada, who design and build net zero energy homes in a northern climate and are known for their building science expertise. Robert Bulechek, a RESNET HERS Energy Rater, EPA Energy Star 3 Rater, BPI Building Analyst Pro, BPI Building Envelope Pro, BPI AC & Heat Pump Pro, Energy Efficiency Consultant and a Level I Thermographer. 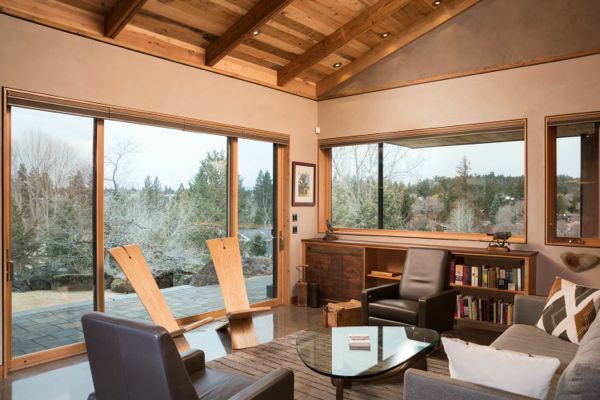 Paul Poirier of Paul Poirier + Associates, a licensed architect in California, Nevada, and Alabama and a member of the AIA California Council’s Committee on the Environment. Bruce Hammond, CEO of Hammond and Company, a construction services and development company focused on identifying and utilizing construction technologies and practices that minimize environmental impact. About Green Builder Magazine: Green Builder® magazine is the building industry’s leading magazine focused on green building and sustainable development. Green Builder offers practical, cost-effective information to a community of the most advanced building professionals across the country. The magazine’s nationally award winning editorial team blends top-quality visionary content with sophisticated design to generate an unforgettable publication that addresses the most important issues of our time.